Part of one of the most popular Columbus routes for bicyclists is being upgraded to include pavement markings at a key intersection that will help bikes avoid collisions with turning vehicles. The so-called "bike boxes," pavement markings in the shape of a box, are to be installed next year on Milton Avenue on both sides of the intersection at W. North Broadway. When the traffic signal is red, bicyclists will be allowed to ride past stopped vehicles on Milton to wait in the box at the head of the line until the light changes. How does a bike box work? Just wanted to pass along an event I recommend tomorrow (Saturday, the 11th of Oct.) -- a "Meet the Artist" hour with Dorothy Gill Barnes. Dorothy's a local octogenarian who makes amazing objects out of trees and other natural materials, blown-glass, and optical-lenses. It's part of the "Bending Nature" show at the Franklin Conservatory (E. Broad, just west of Nelson) that runs through the rest of the year -- artists from around the world working with nature. Dorothy meets people at NOON, tomorrow. I've not yet seen the show, but have seen some of her work, and it's incredible. I'm sure her presentation will be entertaining to all. Admission cost is $7.50 for adults/$6 for student/seniors... but, that gets you admission to the whole show, indoors & out. And it looks like the weather's going to be great. The International Cycling Union (UCI) has given Lance Armstrong permission to start the Tour Down Under in January, although Armstrong missed the deadline for enrolling in the organization's anti-doping program by ten days. "This decision has been made after a careful assessment of the situation, taking into account both the applicable regulations and the imperatives of the fight against doping which is the UCI's number one priority," read a statement from the UCI released Wednesday morning. "The UCI can confirm that Lance Armstrong has and will be the subject of very strict monitoring throughout the period running up to his return to the peloton," the release continued. The decision by the UCI will not face opposition from the World Anti-Doping Agency, either. Director general David Howman, the agency's chief legal counsel, said that WADA rules would not bar Armstrong's return, no matter what the time gap. They have moved on from just installing them. Now they want to be functional and look cool. The New York City Department of Transportation (DOT), in partnership with the Cooper-Hewitt National Design Museum and the support of Google Inc. and Transportation Alternatives, is pleased to announce an international design competition for new bicycle parking for the City of New York. As part of our effort to promote cycling as a sustainable, mainstream transportation option and in keeping with the environmental goals of PlaNYC 2030, DOT is seeking to tap the creative energy of the world design and art communities for this important element of street furniture. The purpose of the competition is to develop functional, well-designed sidewalk racks and to generate new concepts for bicycle parking inside commercial and residential buildings. These two initiatives, in addition to NYCDOT’s commitment to increasing the number of miles of bicycle facilities, providing the City’s first sheltered bike parking stations and creating more bicycle parking at transit stations, will raise the profile of bicycling as a convenient mode of transportation in New York. Although bicycle lanes are the most noticeable element of the City’s cycling infrastructure, access to parking is also essential. Indeed, a study conducted by the Department of City Planning found that lack of access to secure bike parking was the primary reason cyclists did not ride to work. The current standard fixture for bicycle parking consists of variations of a fabricated square steel tube called the “CityRack” that is mounted on sidewalks. These fixtures occupy little space on the sidewalk and do not obstruct the flow of people or goods. New York City currently has thousands of CityRacks within its five boroughs and plans to add thousands more in the foreseeable future. The CityRack design, however, has been in use for over ten years and does not fulfill the potential to be an icon for New York City cycling. The City intends to use the winning sidewalk rack as its new standard for bicycle parking. The design for the in-building rack will first be installed by Google in its New York City headquarters. It may also be used by City-owned buildings in the future, when possible. I have started to post gnome pictures from my trips and other gnome handlers. If you are traveling soon, let me know and I will try to get a gnome to you so that you can document the adventures properly. Thanks to Giles from illumiquest for some of the pics. He is a great photographer. If you need commercial photography give him a call. Did anyone make it to Critical Manners? I was not able to go. It went pretty well. I think we had 30+ riders. Jeff explained the purpose of the ride, and I gave about a 10 minute road rules talk. We left the statehouse around 5:50 and rode the 10 mile route in about an hour. The route was east on Broad, right on Grant, left on Town/Bryden to Alum Creek trail. We did a short loop in Bexley and then headed back downtown on Greenway and Mt. Vernon. We stopped twice to regroup at the Alum Creek trail and at Columbus State. It was getting pretty dark when we got back to the start. It was very nice to meet some of the members of CB that I only knew from their user names. Seeing NotKilledYet's (Brent) light setup. Quite a sight. Getting rid of half of the Street Smarts in my pannier. Seeing Lisa's 6 speed Ross, which she rode on CFC. David saw a cruiser with 3 or 4 police officers who smiled and waved at us at Grant & Town. Several cyclists hadn't ridden downtown before and said they really enjoyed it. The swaying side to side of the bridge over Alum Creek. I never experienced that before, but I've never ridden over it with 30 cyclists before. I ran a stop sign turning right off Westland onto Fair. I got called on it! The neighborly greetings from residents on Mt. Vernon. Some young men telling us to vote Obama, very young kids cheering us on, a couple women at a red light commenting on the wonderful weather for a ride and an older gentleman on his porch also cheering for us. I was honking my Honka Hooter horn for all the kids we rode by. If I remember correctly, the only question I was asked was which hand signal to use for right turns. I use either one, depending on which one I think others can see better. I think it would be cool to be pedaling the bike when Elliot rides/flies across the sky with E.T. I don't know if I will be able to make this one, though. I didn't make it. After riding 110+ miles over the weekend I decided to take a break. I did head down to the High Beck. The group showed up and then most just kept riding. Not many people stopped to partake in the pizza and beer. If anybody would like to file a ride report please post a comment or email it to me. Need to slice pizza while riding your bike? It can get messy, but it is possible. Much easier when you have your bike in the kitchen while slicing pizza on the counter. COLUMBUS, Ohio — The Franklin County Sheriff's Office is investigating a hit-and-run crash that injured a bicyclist early Monday. According to deputies, the incident occurred shortly before 2 a.m. along Frank Road, east of Brown Road in southwest Franklin County. A 19-year-old was riding a bicycle when he was struck by a white Ford F-150 or F-250 white pickup, deputies said. The pickup continued driving east along Frank Road, investigators said. According to deputies, the pickup has a beat-up bed and no tailgate and should have damage to the right front headlight, hood, fender, bumper and turn-signal area. The name and condition of the bicyclist was not immediately released. Anyone with information about the vehicle or driver is asked to contact the Franklin County Sheriff's Office Traffic Bureau at 614-462-6113. 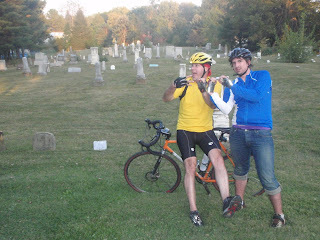 ElectionCycle.com is a 50-day bicycle adventure and journalistic endeavor to increase issue awareness during the final months of the 2008 presidential election. My route will begin in New York City on September 14th and will take me through a dozen states before ending in New Orleans a few days before the election. While on the road I will be meeting with Americans from a variety of backgrounds, interviewing potential voters and discussing the issues that matter to them. My goal is to successfully profile “50 Voters in 50 Days” in order to discover the issues that determine their vote. ElectionCycle.com has no political agenda, and will remain non-partisan and unbiased. We are here to facilitate the expression of voter concerns, not advocate for a candidate. To accomplish these goals, ElectionCycle.com’s multimedia platform will engage visitors of all ages, backgrounds and political affiliations in the discussion about our next President and his responsibility to address our issues. Last year I met a bunch of riders through my boss and rode a good bit with them. Then I started riding on other rides and met a whole bunch of different people who I ride with. So I got an email from Bob who organizes rides from his condo in Canal Winchester. Bob is an amazing rider and navigator. If he says 50 mile ride he means it. He picks out the roads from his memory and plots a course and is almost dead on with mileage. I haven't ridden with Bob and the rest of group for months since an aborted attempt to ride to Granville. Tricia, David, Barb, Marvin, Bob and I rode out south from Canal. We headed southeast and lo and behold rode into and through Bloom past Bloom Carroll HS. Ah, the memories. From yesterday. 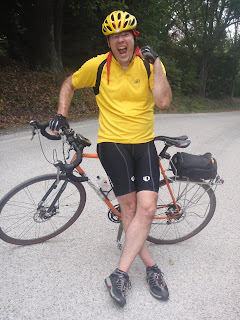 We followed the Fall Hoot route for a while and then split off and followed the Millersport Corn Fest route north. Then as we got closer to Millersport we followed our own route. We stopped in Millersport for lunch at the Upper Deck Coffee House. Food was ok, I had the rueben. We left town following the Corn Fest route and then headed east on Stemen and turned south on Allen. Basil Western brought us further west to Canal and we wound through town to Bob's place. Good recovery ride. With Brian in Baltimore OH celebrating the big 3000 milestone. Well... On Saturday I was pleased to pass my personal record of 2958 miles. I also broke 3000 miles for a year on the same day. The riders. Three of us. We couldn't get out early enough to make the start with the regulars. So we decided to head out when it became a little warmer, around 1:30PM. The route started from Bloom Carroll High School, as do many of the COP rides. We headed south through rollers, skirting Lancaster to the east. We climbed Savage Hill (where I broke my personal record), Carpenter Hill (?) and Chicken Coop. On one of the downhills we had dogs run out in front of us which was a little scary. I also topped 40mph on one of the downhills, sweet! More rollers and then into the valley to Bremen. We stopped at the Marathon gas station for some water and pretzels and hung out to BS for a while. Coming into and out of Bremen we took 664. 664 heading north of Bremen is a climb with rollers. It starts to flatten out at the northern section of the ride. We stopped in Baltimore for a photo op for my 3000th mile. Then back to Bloom for the finish. Got to celebrate with some a whole lotta Arby's.